UPDATE:9:30 PM 3/3/2010:For the latest on this ongoing story click here. UPDATE:12:20 PM: The Portland Press Herald reports owner Brian Petrovek says "No deal with Albany" is done. The CMSB has reached out to the Portland Pirates for their side, as of this update, we have not received a response. Note : The CMSB is the official blog of 96.3 The Big Jab. 96.3 The Big Jab is owned by Atlantic Coast Radio. ACR's 95.5 WLOB is the Flagship station of The Portland Pirates. UPDATE:10:00 AM: The Pirates canceled their practice at the Portland Ice Arena this morning. UPDATE 8:45 AM: Jeff had a chance to speak with Neal Pratt, Chair of the Cumberland County Civic Center Board of Trustees, who confirmed the update this morning. He stated, "renovations have never been the sticking point. We have continued to work with the Pirates throughout the process making renovations part of the deal, a good deal. To portray the renovations being the sticking point is false." He declined to comment on the Albany story, saying, 'It has no impact on our continuing discussions with the Pirates." Pratt also confirmed they met with Pirates officials as recently as yesterday. "is still in the mode of keeping the Pirates in Portland. It is important to note that finances remain the important issue of the deal. The county's negotiating position has never changed, we are working towards the best deal for the trustees and the county tax-payers." UPDATE:7:40 AM A new source has stepped forward on this and has broken down some of the reasons for the Pirates leaving. According to the source, Petrovek has been in negotiations with Cumberland County officials on a new lease agreement. Currently the Pirates pay approximately $2500 per game in rent to the county. Petrovek gets 100% of parking revenue, and none of the concessions, which is the major sticking point. Petrovek wants 85-100% of the concession revenue (he would settle for 90%), but the county would not budge. Petrovek has also tried to become the GM of the building, something else that Cumberland County would not agree to. Petrovek has tried unsuccessfully in recent years to purchase the arena or get more control over it, only to be denied by the county each time. In Albany, expect many of the issues Petrovek had with the CX4 to be addressed to his liking. Original Story: According to sources with first-hand knowledge of the situation, an agreement in principle between the Portland Pirates and the Times Union Center in Albany has been reached. The source, who requested anonymity do the sensitive nature of negotiations, stated "if the i's are dotted and the t's get crossed", a formal announcement could be made by the end of this week or next. Another source in Portland, familiar with the negotiations, states they have information from within the Pirates organization "saying the same thing. In all honesty, it's more than obvious." The source also states Portland shouldn't have much to fear as "there are teams lined up to take the Pirates' place." The Portland Pirates, who brought AHL Hockey back to Portland in the 1993-94 season after the Maine Mariners left town to become the Providence Bruins, have been in negotiations with Cumberland County officials about extending the lease to the building, but have been unable to reach an agreement due to the financial demands of Pirates owner Brian Petrovek (see update). The Buffalo Sabres, who are the Pirates parent franchise, would agree to the move and have "supported it", due to the fact Albany is considered (for TV purposes) a Sabres market. They envision a scenario "similar to what the Bruins have with Providence, especially in terms of player movement." Although there is a possibility a deal has been reached with Albany to "force the hand of Cumberland County officials", in all likelihood once an announcement has been reached it will signify the end of another AHL era in Maine. The Adirondack Phantoms, rumored to be a potential replacement, will be moving to an Allentown, PA arena at some point (although the shovel hasn't hit the ground in building it yet). The Lowell Devils are currently negotiating another deal for Tsongas Arena, and there are whispers they would look to move to Portland if the Pirates go to Albany. Lowell's lease with the Tsongas Arena expires at the end of this season. 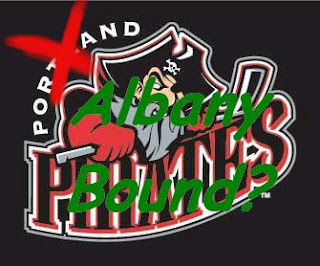 A "Save our Pirates" rally in Portland last week drew a handful of fans to protest a move to Albany. A Facebook page of the same name currently has over 1600 fans. The owner of the Portland Pirates hockey team told Mainebiz this afternoon he is "optimistic" the team and the Cumberland County Civic Center Board of Trustees will reach an agreement to extend their lease beyond April 30. Brian Petrovek, managing owner/CEO of the Pirates, also says news of a deal with the Times Union Center in Albany is just a rumor. "We have no tentative deal with Albany or Portland," he says. Petrovek's comments could be good for the civic center and the city, which have benefitted greatly from having this American Hockey League franchise here for 17 years. Neal Pratt, chairman of the civic center's board of trustees, says there is a lot at stake. Pratt says the facility, which has a capacity of 6,800 seats, generates $12 million to $15 million per year for the greater Portland economy. Both sides hope they are moving closer to an agreement with the same anticipation hockey centers feel just before the puck drops. "The good news is we're still at it and we're still talking," says Pratt, who is also an attorney and a partner with Preti Flaherty in Portland. "We're hoping to work something out, sooner rather than later." Pratt says the civic center, which is 33 years old, managed to stay in the black for six years until the struggling economy landed it in the red in 2009. The Pirates also had a tough year, he says, and both parties want to develop new ways to generate more revenue. During the 2008-2009 season, the Pirates generated $384,278 for the civic center, a little less than one third of the facility's annual revenue of $1.26 million. (For more on the Pirates' economic impact, see "By the numbers," below). Petrovek says the Pirates and the trustees are discussing new revenue options such as naming rights for the entire facility or sub-naming rights, which could include placing a company's name on the ice surface or at the main entrance. New revenues could come from a different approach to how the facility sells food and beverages that may involve holding more events and not raising existing prices. According to Petrovek, the current negotiations for a lease extension are not tied to whatever future renovations occur at the civic center, though there has been talk of adding luxury seating and other fan amenities since the team's owners purchased the Pirates 10 years ago. But Pratt says the trustees' goal to renovate the civic center figures prominently in the lease talks, but not knowing for sure what those renovations will be or how much future revenue they will generate makes negotiations more difficult. In December, the trustees hired a Washington, D.C., consulting firm to conduct an economic feasibility study for renovations, and have targeted 2012 for starting the project. Meanwhile, the owners of the Times Union Center in downtown Albany continue to dangle their state-of-the-art facility in front of the Pirates like a carrot. According to the Times Union Center's website, the facility's seating capacity ranges from 6,000 to 17,500. The building opened in 1990, making the Albany County-owned venue 20 years old. The center also has 25 luxury suites with 16 seats, cable television, private bathrooms and refrigerators. The threat that a potential Pirates' move to Albany "creates an elephant in the room for the purpose of negotiations," Pratt says. "The hope is that New York doesn't end up giving the Pirates a deal they can't refuse."